For comparability with other cities around the world, Greater Brisbane has been defined as the metropolitan area extending from Elimbah and Bribie Island in the north to the Pimpama River and Maclean in the south, and the Brisbane Forest Park in the west. This built-up area takes in the Cities of Brisbane, Logan, Redland and Redcliffe, the urban and semi-urban parts of the City of Ipswich, most of the former Shire of Pine Rivers, the north-western parts of the City of Gold Coast and parts of the Shire of Beaudesert and the former Shire of Caboolture. Of the names of the 447 suburbs and neighbourhoods in the Brisbane-Redcliffe-Ipswich-Logan Metropolitan area, 110 (24.6%) are based wholly or in part on place names that can be found in Scotland, on Scottish family names or on Scottish words. Of course, many of the names are used in other parts of the British Isles as well but at least 51 (11.4%) of these appear to have a direct or indirect connection with Scotland. The name Brisbane itself is Scottish and was chosen in 1823 by John Oxley, Surveyor-General and explorer, in honour of Sir Thomas Makdougall Brisbane ((1773-1860), Governor-General of New South Wales. Albany Creek (Albany Burn in South Ayrshire) but also several places in England including Albany itself in Sunderland. The suburb was actually named in 1885 in honour of the Duke of Albany (presumably Queen Victoria's youngest son Leopold or his son, also Leopold). This noble Scottish title was first conferred in 1398 upon Robert, brother of Robert III (born John) of Scotland. The suburb was known as Chinaman's Creek until 1885 when the name was changed by the Queensland Government to honour the Duke of Albany. Armstrong Creek - Armstrong is a Lowland Scottish family name, though the name is also frequently encountered today both in England and in Ireland, having no doubt travelled there from Scotland. Auchenflower (Dumfries & Galloway and South Ayrshire). Auchen is the Gaelic word for 'fields', the Brisbane suburb being named after Auchenflower House, the home of Scots-born Sir Thomas McIlwraith, Premier of Queensland between 1879 and 1883 (with two further, but brief, terms of office during 1888 and 1893). Balmoral (Balmoral Castle, the royal residence on the river Dee in Aberdeenshire). According to the Place Names of South East Queensland website, the suburb was proclaimed in 1888 in honour of the royal residence in Scotland acquired by Queen Victoria and Prince Albert in 1852, the choice of name probably having been influenced by the existence of Balmoral House in the area. Bannockburn (Stirling). 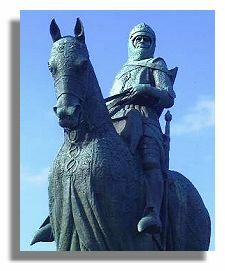 The town of Bannockburn has special significance in Scottish history as it was the scene of King Robert the Bruce's victory in 1314, which secured Scotland's full independence from England for the next four hundred years. According to the Logan City Council website, Bannockburn was the name of Alexander Watt's original sugar lease, which was taken up in 1869 with Colin Munro and John Young. Alexander Watt arrived in Brisbane in 1854, and became one of the pioneers of the local sugar industry. Brendale (Orkney Islands, on Rousay). This suburb was named after a property (a horse stud) that was established in the early 1960s by William Bowden (Queensland Government website). Brisbane (Brisbane Mains in North Ayrshire) and East Brisbane, Port of Brisbane and South Brisbane by association. 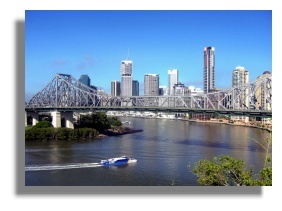 The city took its name from the Brisbane River on which it stands. The river was named in honour of Sir Thomas Makdougall Brisbane who succeeded Macquarie (a fellow Scotsman) as Governor of New South Wales in 1821. Sir Thomas was born in Largs, Ayrshire. The site of the early settlement of Brisbane was originally called Edinglassie, which name was apparently created as a blend of Edinburgh and Glasgow. Closeburn (Dumfries & Galloway). The name of this suburb comes from the railway station, which was named in 1901 after the town in Dumfries & Galloway. Colmslie (Scottish Borders). According to the Journal of the Royal Historical Society of Queensland (Vol. 15(9), 1994) the suburb's name was derived from Colmslie House, built by William Cairncross (c.1814-1896), businessman, who used the name of a Cairncross family estate in Scotland. Darra (Aberdeenshire). This suburb derived its name from the local railway station, which may have been named for a station on the Aberdeen-Banff Railway line. Alternatively, the name could be Aboriginal (Yugarabul 'durra' meaning 'thigh', or Yugumbir 'darrau' meaning 'loose stones'). Fortitude Valley - the name of this suburb near the city centre has a Scottish connection. The name perpetuates the immigrant sailing vessel 'Fortitude', "one of three vessels chartered by John Dunmore Lang (1799-1878) clergyman and politician, to carry free immigrants from Scotland to Moreton Bay in 1849." (Queensland Government website). Gailes (North Ayrshire). The suburb took its name from the nearby Gailes Golf Club, which had been named by Dr Henry B. Ellerton, Superintendent of Goodna Asylum, after the Western Gailes Golf Course in Ayrshire near his wife's birthplace (Queensland Government website). Prior to the mid-1920s, the area was known as Dingo Hill. Gordon Park (Gordon in the Scottish Borders as well as many other places throughout Scotland with Gordon as part of the name, e.g. Gordonstoun, Gordonstown and Gordonsburgh). Gordon is also the name of a place on the Isle of Man, probably having been taken there by Scottish settlers. The Gordon tartan seen most frequently is the regimental tartan of the Gordon Highlanders. Griffin - This northern suburb owes its name to the Griffin family from the Orkney Islands who migrated to Australia after living at the Cape of Good Hope for some years (Place Names of South East Queensland website). Griffin is not a particularly common family name in Scotland, nor is it certain that George Griffin was born in Scotland but he married Jane Taylor at Stromness in the Orkneys in 1812. The Ancestry.com website suggests that the family name Griffin developed in England, Ireland and Wales from three independent sources: Middle English, Irish Gaelic and latinised Welsh. (see also Whiteside below). Haigslea - This semi-rural suburb of Ipswich was originally known as Kirchheim. The name was changed to Haigslea in 1916 because of anti-German feeling caused by World War I. 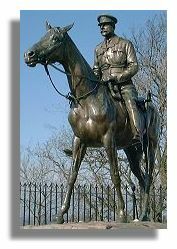 The new name was chosen in honour of Edinburgh-born General Douglas Haig (1861-1928), Commander-in-Chief of the British Army in France between 1915 and 1918. His statue (seen here) is on the esplanade of Edinburgh Castle. Hamilton (South Lanarkshire). The name Hamilton has been associated with Scotland since the thirteenth century, probably having been taken there by Walter Fitz Gilbert (Sir Walter de Hameldone). Hameldome/Hamelton was the name of Sir Walter's estate in England. According to the Penguin Dictionary of British Place Names (Room, 2003), Hamilton in Old English means 'farmstead in broken country'. Hamilton is one of the most frequently recurring Scottish place names around the English-speaking world. The suburb apparently takes its name from a hotel built in the middle of the 19th century by Gustavus Hamilton, a solicitor from Toowoomba. Ironside (Aberdeenshire). The suburb was named for William Alexander Wilson's wife, using her maiden name. Wilson, the owner of a local sugar cane plantation, was born in St Lucia in the West Indies. Kelvin Grove (City of Glasgow, spelt Kelvingrove). According to the BRISbites website, the suburb takes its name from the garden planted around his home by Dr Joseph Bancroft in 1868. Dr Bancroft was a botanist and scientist. His garden reminded him of Kelvin Grove Park in Glasgow. 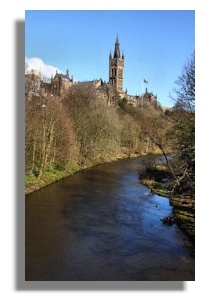 The graphic here shows the River Kelvin and Glasgow University at Kelvingrove. Kenmore and Kenmore Hills - there are places in Argyll & Bute, Highland, Perth & Kinross and Western Isles called Kenmore, which means 'big headland' in Gaelic. These suburbs were named for Andrew Todd's birthplace in Scotland, but which village, precisely, is not known. Logan, Logan Central, Logan Reserve and Logan Village - there are places in Dumfries & Galloway and in East Ayrshire with the name Logan. The names of these suburbs are derived from the Logan River, which in turn commemorates Captain Patrick Logan, Commandant of the Moreton Bay Settlement (a penal colony for convicts) between 1825 and1830. The youngest of nine children, he was born at East Renton in Berwickshire, which is now part of the Scottish Borders. Captain Logan gained a reputation for cruelty and was found murdered in 1830, under mysterious circumstances. Loganholme - the name of this suburb appears to be based on two elements: the River Logan (see Logan above) and a pioneer by the name of Holmes, who operated a ferry in the area in the later 1860s (Logan City Council website). The name is therefore Scottish in part (Holmes being an English family name). Loganlea (West Lothian). This suburb, like its neighbours, also took its name from the Logan River and was therefore indirectly named for Captain Patrick Logan rather than the village to the west of Edinburgh. MacGregor - there is a water feature called Macgregor's Leap in Perth & Kinross, near Woodend in Glen Lyon; also McGregor's Cave. The suburb was named in honour of Sir William MacGregor (1846-1919), medical practitioner and Governor of Queensland between 1909 and 1914. Sir William was born at at Hillockhead, in the parish of Towie, Aberdeenshire, Scotland (Australian Dictionary of Biography). MacKenzie - there is a Mackenzie's Cairn in Glen Moriston, Highland. The suburb was named after Colonel W. Mackenzie, a pioneer settler in the area who owned a sugar mill there (BRISbites). Macleay Island - Macleay is a Scottish family name, a variant of McClay. Known originally as Tim Shea's Island, the current name was given by Surveyor Warner who named the island, and thus the suburb, after Alexander Macleay who was the Colonial Secretary of New South Wales from 1825 to 1837. (Article on Macleay Island, retrieved from Wikipedia in October 2009). The Hon. Alexander Macleay (1767-1848) was a leading member of the Linnean Society and a Fellow of the Royal Society. He was born in Ross-shire, Scotland. McDowall - a Scottish family name, the MacDowalls being a sept of Clan MacDougall. The Brisbane suburb was named after a local landowner, Ambrose McDowall, who apparently came from Liverpool in England (see also Everton Hills and Everton Park below). Morayfield - Moray is an ancient Scottish county east of Inverness. This northern suburb's name came from the sugar plantation name given by George Raff (1815-1889) merchant, sugar grower and politician. Raff was born at Forres, Morayshire, Scotland (Queensland Government website). Morningside (Dumfries & Galloway, City of Edinburgh, North Lanarkshire and Perth & Kinross). Morningside is a popular name in several cities around the English-speaking world. The origin of the name of the Brisbane suburb is uncertain. 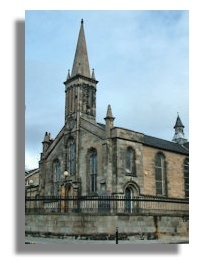 The graphic here shows Morningside Church in Edinburgh. The Queensland Government website provides the following explanation: "Probably the name was derived from an estate name, which could have been linked with the Scottish town name, or alternatively could have been named because the estate was on the 'morning' or eastern side of Brisbane." A similar explanation is given in the BRISbites website: "Morningside was reputedly named for the fact that its hills caught the first of the morning sun. This may have been because it was east of the main settlement at north Brisbane. It is one of the older suburbs of Brisbane and was established under the Electoral District Act in 1872." Muirlea - According to the Queensland Government website, this name came from a former railway station name, used from June 1884, and which had been derived from the surname of local landowners John and Andrew Muir. Muir is a Lowland Scottish name first found in Ayrshire. New Beith - there is a place called Beith in North Ayrshire; also Beith Og, a mountain in the Scottish Highlands. According to the Logan City Council website, the name of the suburb is attributable to Richard Tyson Wilson, a solicitor who took up land in the Maclean district in 1889. He named the district New Beith in honour of his wife's hometown of Beith (presumably in Ayrshire). Ormiston (Scottish Borders, East Lothian, Fife and West Lothian). The suburb takes its name from the railway station. The name of the station was derived from Ormiston House, the residence of Louis Hope (1817-1894), a grazier, sugar cane farmer and miller, who named his house after a village in Lothian, Scotland (Queensland Government website). In the Place Names of South East Queensland website it is noted that Captain the Honourable Louis Hope was the seventh son of the first Earl of Hopetoun. Described as "a man of style", Hope built Ormiston House with the aid of Scottish tradesmen who had been brought to Queensland to perform the work, the bricks being baked in a kiln on the property. Petrie and Petrie Terrace - the names of these suburbs commemorate the Petrie family. Andrew Petrie was a civil engineer from Edinburgh who was appointed Superintendent of Works in Brisbane in 1837. His eldest son, John, took over the family's highly successful building and construction business. The firm secured many government contracts, including fittings and furnishings for the new Parliament House. John Petrie was elected the first Mayor of Brisbane in 1859. Robertson - there is a Robertson Park in Renfrewshire based on this Scottish surname (that's its tartan shown here). A relatively new suburb (1967), Robertson was named after Doctor William Nathaniel Robertson CMG, CBE, medical practitioner and Vice Chancellor of the University of Queensland between 1926 and 1938 (BRISbites). Dr William Nathaniel Robertson (1866-1938) was born in Edinburgh, the son of a Presbyterian minister, Rev. Peter Robertson. After graduating in medicine from the University of Edinburgh he joined his parents in Queensland and took up general practice at Ipswich. Strathpine - although this name does not exist in Scotland, it has a definite Scottish connection. The name of this outlying suburb is derived from the Scottish word 'strath' (Gaelic 'srath') meaning 'valley' and the Pine River on which the suburb is located (Queensland Government website). Sunnybank and Sunnybank Hills - the name Sunnybank occurs in the Scottish Borders, Dumfries & Galloway, East Lothian and the Orkney Islands. Although the name is also found in both England and Wales, these Brisbane suburbs are named after a farm in the area owned by S. and A. Gillespie who migrated from Scotland in 1862, arriving in Brisbane on the Rajastan. According to the BRISbites website, the Gillespies named their farm Sunnybrae (or possibly Sunnybank), after the village from which they came. The Railways Department used the name Sunnybank for the new railway station in 1885 when the line was built through the Gillespie farm. The Queensland Government website, however, suggests that S. Gillespie's birthplace was a village in Lancashire, England, called Sunnybank. Swanbank - According to the Queensland Government website, this suburb was named by an early pioneer, James Foote, for his wife's birthplace in Scotland. Two earlier names were Logan Lagoon and later Josey's Lagoon. Neil Heather, a descendant of the Footes, has supplied the following information to confirm the Scottish link: "I note that you correctly attribute the origin of the name Swanbank (Lagoon), on the outskirts of Ipswich to Catherine Foote née Cramb of Bleak House, Rose Hill (later Limestone Hill then Eastern Heights) Ipswich. She was born c.1827 at Swanbank, Lanark, Scotland to Sarah Galloway Cramb née Swan, one of my forebears. So Swanbank was her maternal family place. This confirms your archival information." (Neil Heather, personal communication, 2 July, 2006). In a subsequent communication received on 13 September 2009, Neil Heather notes "[Swanbank] was the home of my maternal ancestors Robert and Grizel Swan in Lanark Scotland and birthplace in 1823 of their granddaughter Catherine who with her husband James Foote acquired the Ipswich property including the lagoon in the latter half of the 19th century. Whitehill Rd in Ipswich also has a Lanark counterpart and was probably named by Catherine or her sister Sarah Menzies." Torwood (Dumfries & Galloway and Falkirk; also Torwoodlee in the Scottish Borders). Since Torwood is a neighbourhood of the Brisbane suburb of Auchenflower, a Scottish connection seems almost a certainty. 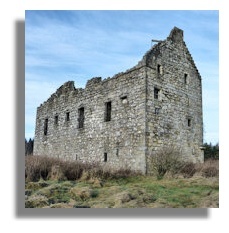 The illustration here is of Torwood Castle, Falkirk. Whiteside (Aberdeenshire, Scottish Borders, Dumfries & Galloway, North Lanarkshire, Perth & Kinross, South Lanarkshire and West Lothian) also found, but far less commonly, just over the border in Cumbria and Northumberland, and is sometimes spelt White Side. There appears to be a definite Scottish link with the name of this suburb since it recalls the family residence built by George and Jane Griffin (see Griffin above) who came from the Orkney Islands (Place Names of South East Queensland). Wishart - According to the BRISbites website, this suburb was named after the Wishart families who were early settlers in the area. Robert Wishart, merchant, was born in Edinburgh in 1854. One of Scotland's best-known bearers of this family name was George Wishart, Scottish reformer and Lutheran martyr. Woodend (Aberdeenshire, Argyll & Bute, Scottish Borders, Dumfries & Galloway, East Lothian, Falkirk, Fife, Highland, Moray, North Lanarkshire, Perth & Kinross, South Lanarkshire and Stirling) also common throughout England, sometimes spelt Wood End. The suburb was named after the home of Arthur Macalister, a solicitor who became Premier of Queensland. Arthur Macalister ("Slippery Mac") (1818-1883) was born in Glasgow. It is therefore reasonable to class Woodend as a Scottish place name in this instance, assuming that Macalister bestowed the name. Some of the following suburbs and neighbourhoods may also prove on further investigation to have a direct or indirect Scottish connection, but these names are associated with other parts of the British Isles as well. Archerfield (East Lothian). According to the Queensland Government website, the Brisbane suburb takes its name from a property bought by Michael 'Stumpy' Durack. The property, in turn, had been named for the Archer family (Brisbane History Group, 1990) and therefore suggests no link with the village in East Lothian. As a family name, Archer is far more likely to be English than Scottish. Bellmere - this name does not occur within the British Isles. It is possible, however, that it refers to the Scottish family name of Bell. Alternatively, it could be a made-up name, using Old French and Old English elements in the sense of 'beautiful lake'. Boondall - there is a Boon, Boon Hill, Boondreigh Burn, Boondreigh Water and Boonraw Burn, all in the Scottish Borders; also Boonslie in East Lothian and Boonatown in the Orkney Islands. An equal number of places in England have Boon as an element in the name. It has been speculated that Boondall may be an Aboriginal word but linguists have had difficulty associating it with a local dialect. Bracken Ridge (South Lanarkshire, spelt Brackenridge) also in North Yorkshire, England, spelt Bracken Ridge. The favoured explanation given for the origin of the name of this Brisbane suburb was the profusion of bracken fern on the estate in early settler days (BRISbites and Queensland Government websites). It is nevertheless worth noting that the suburb was named after a property called 'Bracken Ridge', which was owned by a family bearing a Scottish surname, Ferguson. The family is commemorated by the name of a local park in the suburb, Ferguson Park. Browns Plains - there are numerous places in both Scotland and England that appear to be based on the family name of Brown. The surname Brown is also very common in both countries, with surveys in the 1970s suggesting that it is the second most common family name in Scotland (after Smith) and the third most common in England (after Smith and Jones). No information is available on the identity of the individual whose name was given to this suburb. According to the Logan City Council website, surveyor Robert Dixon used Browns Plains as a place name as early as 1840. Chambers Flat - Chambers is a Scottish and English family name but occurs as a place name only in England. In the Logan City Council website it is stated that in 1848 an early settler by the name of John Chambers took up three adjoining lots in the region now known as Chambers Flat. Grange (Aberdeenshire, Dumfries & Galloway, East Ayrshire, Fife, Highland, Midlothian, Orkney Islands, Perth & Kinross, South Lanarkshire and West Lothian). There are also many other places in Scotland with Grange as an element in the name, but Grange is even more popular in England than it is in Scotland and is also fairly commonly used in parts of Ireland and Wales. Greenbank (Scottish Borders, City of Edinburgh, Falkirk, Moray, Shetland Islands and South Lanarkshire) also fairly common in northern England, usually spelt Green Bank. Greenwood Village - there are places called Greenwood in the Scottish Borders, Moray and South Lanarkshire. However, being a descriptive name, Greenwood occurs in England and Ireland as well. One of the inspirations for the name, which occurs in several cities around the world, may well have been Robin Hood's 'The Greenwood'. Hill End (Scottish Borders and Fife) but even more numerous throughout England. Kingston (Angus, City of Glasgow, East Lothian, Moray and Renfrewshire) also all over southern England and is found in Ireland and Wales as well. The suburb was actually named after Charles and Harriet Kingston (ancestry not reported), residents in the Logan area during the late nineteenth century. The area was named Kingston after the railway went through and this was formalised by the Surveyor General in 1890 (Logan City Council website). 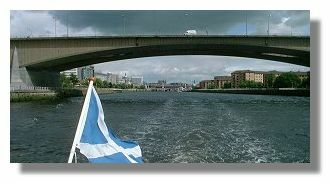 The illustration shows the Kingston Bridge over the river Clyde in central Glasgow. Lyons - there are several places in Scotland with Lyon as part of the name (Lyoncross in East Renfrewshire, Lyonshield in North Ayrshire, Lyonston in South Ayrshire and the River Lyon and Glen Lyon in Perth & Kinross). These names refer, quite possibly, to the Scottish family of Lyon or Lyons. However, since the name is of Norman origin, it also occurs widely throughout England and Ireland. According to the Logan City Council website, the suburb was named for the Lyons family (ancestry not reported) who lived in the Greenbank/New Beith region in the late nineteenth century. Mitchelton - although there are places in Scotland, as well as in England, Ireland and Wales with Mitchel (single l) as part of the name, this Brisbane suburb was actually named for a nineteenth century farmer, Nicholas Mitchell (double l). The graphic shows the Mitchell clan tartan. Mount Crosby - Mount Crosby could well prove to be another Brisbane suburb whose name has a Scottish origin. According to the BRISbites and Ipswich City Council websites, the hill that gave its name to the suburb had its name changed from Belle Vue Hill to Mount Crosbie, with a further change to Mount Crosby. The earliest farmers in the area came from the Scottish-English borderlands, with both sources mentioning "Crosbie-on-Eden". There appears to be no "Crosbie-on-Eden" in the British Isles today. There is, however, a place called Corsbie, very near Eden Burn in the Scottish Borders. Moreover, the earliest farmers in the area, Thomas Armstrong, John Duncan and Malcolm McDougall, had distinctly Scottish names, which increases the probability that the name Mount Crosby has a Scottish rather than an English origin. A second theory suggests that the name may honour George Crosby, a gold prospector who worked in the area in the early days. Newstead (Aberdeenshire, Scottish Borders and Midlothian) just as commonly found in England. According to the Queensland Government website, the suburb takes its name from Newstead House, built in 1846 by Patrick Leslie, grazier and pioneer; his house was apparently named for Newstead Abbey in Nottinghamshire, England. Patrick Leslie was born in Warthill in Aberdeenshire, Scotland in 1815. This raises the possibility that Newstead, Aberdeenshire, rather than Newstead Abbey, may have been the source of the name of this Brisbane suburb. Newtown (Aberdeenshire, Argyll & Bute, Highland, Falkirk and Shetland Islands) but found even more commonly in England and, to a lesser extent, in Ireland and Wales and on the Isle of Man. The suburb's name was apparently derived from the name of a housing estate sold by John Rankin about 1865 (Queensland Government website). Springfield and Springfield Lakes - the name Springfield is popularly used in Scotland (Argyll & Bute, Dumfries & Galloway, Fife, Highland and Perth & Kinross) as well as in England and Wales. The Gap (Argyll & Bute) also over the border in Cumbria. This is likely to be a purely descriptive name since the suburb lies between two arms of the Taylor Range, but considering the number of pioneer Scottish and English farmers in the area, an indirect link with either Scotland or England cannot be ruled out. Underwood (Dumfries & Galloway and South Ayrshire) also in England and Wales. The locality was actually named after a farmer, William Underwood (ancestry not reported). William Underwood established the Commercial Hotel on his land to the north of the Beenleigh Road intersection, which operated from the early 1870s through to 1895 when it burnt down (Logan City Council website). Underwood is an English family name, which reduces the chances that this suburb has a Scottish connection. Willowbank (Aberdeenshire, Dumfries & Galloway and Stirling) also in Buckinghamshire, England and County Cork, Ireland. A final category of suburban names comprises places that can be found in Scotland, but which, in Brisbane's case, definitely or most probably have no Scottish connection. Ashgrove (Aberdeen City and Moray) also in three English counties, though the Brisbane suburb was more likely named because of the presence of Moreton Bay ash trees on Henry Holmes' 'Grove Estate' (Queensland Government website). Bardon (Moray) but actually named for Bardon Hill in Leicestershire, England (Queensland Government website). Belmont (Scottish Borders, Shetland Islands and South Ayrshire) also found in England, Ireland and Wales. The suburb takes its name from Belmont House, built around 1860, by Colonel Berneker. The Queensland Government website notes that this is a descriptive name probably derived from Anglicised French 'Bellemont' meaning 'beautiful mountain'. Brookfield and Upper Brookfield - there is a place in Renfrewshire called Brookfield but this very English-sounding name is also found throughout England and on the Isle of Man. According to the Place Names of South East Queensland website, Brookfield was reportedly named in 1868 at the suggestion of a local resident, Lucinda Brimblecombe (née Logan). This was accepted as a name that seemed appropriate for an area drained by streams. It is also stated that the name may have been suggested by Brookfield in the Hunter Valley District of New South Wales near which Miss Brimblecombe's family had lived before coming to Gold Creek. A third factor in choosing the name may have been the fact that Thomas Isaac Jones, an early settler who has been called 'The Father of Brookfield', had been born at Brookfield Cottage, Portsmouth, England, though this may have been a coincidence. Any connection with the place in Renfrewshire, Scotland therefore seems unlikely. Calamvale - Calam is supposedly a Scottish family name derived from MacCallum. According to the BRISbites website, this suburb is named after a pioneering family. Sid Calam, a descendant of the family, points out that the correct pronunciation of the suburb's name should be "Kaylemvale". James Calam was a prominent early settler near the creek on Brisbane's outskirts. His homestead was at the top of Calam Road on the corner of Beaudesert and Compton Roads. In a communication received from Vicky McKenzie, a distant relative of the Calam family, it was stated that her great-great uncle, James Calam emigrated with two of his sisters and their families to Australia from North Yorkshire, England, in the late 1800s, aboard the SS Bulimba, setting up home in what is now known as Calamvale. Mrs. McKenzie confirms that 'Kaylem' is the correct Yorkshire pronunciation of Calam. The link is thus with Yorkshire and therefore English rather than Scottish, though a distant Scottish connection is a possibility. According to 1891 census data reported in the Ancestry.com website, the Calam surname was found in only two British counties - Yorkshire and, to a far lesser extent, neighbouring Lincolnshire. Carbrook - there is a Carbrook Mains in Stirling, while a district of Sheffield City in England is also called Carbrook. Prior to World War I the suburb was known as Gramzow. The Logan City Council website provides the following explanation of the origin of the name: "A new sugar mill owned by Musch and Appel operated at Gramzow from 1905 until 1926. During World War I the name of the area was changed to Carbrook, due to anti German sentiment in Queensland generally. The Gramzow Post Office was taken away from August Stern, renamed and given to another resident of non-German descent." In the Place Names of South East Queensland website, it is noted that Carbrook is the name of a town in South Yorkshire and that it was selected by the local residents from a short-list of names which had been drawn up by the postal authorities. 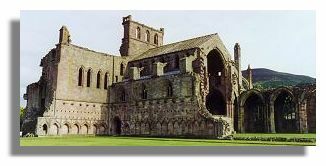 Chapel Hill (Aberdeenshire, Scottish Borders, Dumfries & Galloway, Perth & Kinross and South Lanarkshire) also in England and Wales. This suburb probably takes its name from a primitive Methodist Church built in 1874 on the hilltop (Queensland Government website) and is therefore unlikely to have a Scottish connection. Churchill (a district of the City of Edinburgh) also in England and Wales. The Ipswich City Council website provides the following explanation: "Churchill has taken the name which was given to the whole county in 1845 and used for the local post office which opened in 1892." No information has been found on the reason for naming the county but a Scottish connection seems unlikely. Coopers Plains - places based on the name Cooper are found throughout both Scotland and England. The Cooper family tartan is shown here. This suburb was actually named after Henry Cowper, the Government Medical Officer at the Moreton Bay penal colony between 1825 and 1832, Cowper having become corrupted to Cooper. Dr Henry Cowper was born in Yorkshire, England (Australian Dictionary of Biography). Cowan Cowan - there is a Cowan Fell, Cowans and Cowans Farm in Dumfries & Galloway, Cowan's Croft and Cowans Knowe in Scottish Borders, and Cowans Law in East Ayrshire; also Cowan Bridge in Lancashire, England. Although Cowan can be found in Britain, its origin is more likely to be Aboriginal ('kaun-kaun' or 'daun-daun' meaning 'black' in the Yugumbir language, or 'kauin-kauin' meaning 'blood' in the Kabi language). Everton Hills and Everton Park (Everton in Aberdeenshire and Inverclyde) also Everton in several English counties, including the well-known Liverpool suburb. These suburbs owe their names to an early settler, Ambrose McDowall, who apparently came from Everton in Liverpool. Fairfield (Clackmannanshire, Shetland Islands and Stirling) but found even more commonly throughout England and is also found in Ireland. The origin of the name of this suburb is far more likely to be English than Scottish as it was named after the farm of the pioneering Grimes family, who arrived in Brisbane in 1849 from Warwickshire. Gilberton - there is a Gilberts Rig in Dumfries & Galloway, Gilberts Bridge in Perth & Kinross and Gilbertfield in South Lanarkshire, though Gilbert occurs more commonly in English place names. Gilbert is also a Scottish family name - a sept of Clan Buchanan. The Gold Coast suburb was named in memory of John Gilbert, a naturalist who was killed by Aborigines whilst on one of Leichhardt's expeditions (Reed, 1973). John Gilbert (c.1812-1845) was an Englishman. Herston (Orkney Islands) also in Dorset, England. Although Herston can be found as place names in Britain, the name of the Brisbane suburb is artificial, being formed from the surnames of Robert George Wyndham Herbert (first Premier of Queensland) and John Bramston (politician and public servant). Herbert and Bramston were Englishmen, born in Sussex and Essex respectively (Australian Dictionary of Biography). Lamb Island - although Lamb Island is only found within the British Isles as a place name in Scotland (an uninhabited island in the Firth of Forth) and while there are dozens of other references to places throughout both Scotland and England with Lamb as part of the name, the Brisbane island suburb was actually named for Charles Lamb, the poet and essayist, who was a close friend of Coleridge and who co-authored 'Tales from Shakespeare' with his sister Mary. The connection is therefore with England and not Scotland. Lota - there is a Lota Corrie in the Cuillin Hills on the Isle of Skye. Lota is also a suburb of the City of Cork in Ireland and this, or a similar place elsewhere in Ireland, seems the more likely origin of the name according to local historical evidence (BRISbites and the Queensland Government websites). Mansfield (East Ayrshire, Fife, Inverclyde, Midlothian and Stirling) also in Nottinghamshire, England. The suburb was actually named for Australian-born Sir Alan James Mansfield, Governor of Queensland (1966-1972) and Chancellor of the University of Queensland (1966-1976), whose father had come from England. Mayne (Mayne House in Moray) also Maynetown, a suburb of Dublin, Ireland. The suburb was actually named for Irish-born Patrick Mayne (1824-1865) butcher, grazier and Alderman, and therefore has no connection with Scotland. Milton - an extremely common place name throughout both Scotland and England and is also found in Wales. The name of this Brisbane suburb was actually derived from a farm called Milton Farm, which had been named after John Milton, the famous English poet (Queensland Government website). New Farm (Aberdeenshire, Scottish Borders, Dumfries & Galloway and East Ayrshire; also New Farm Loch, a district of Kilmarnock, East Ayrshire) but found in Essex, England as well. In Brisbane, the name goes back to the 1830s and appears to be purely descriptive of new farmland that had been cultivated to replace a previous farming area for the young penal colony. Newmarket (Western Isles) also in England and Ireland. The area now called Newmarket was previously known as The Three Mile Scrub! The name came into common use when the Brisbane saleyards were moved from Normanby to Newmarket during the 1880s. The origin of the name therefore appears to be a descriptive one and is unlikely to be connected with any particular place in the British Isles. Newport - there is a place called Newport in Highland. However, being a descriptive name, it occurs widely throughout the British Isles. Newport is a newly proclaimed suburb (2008), located in the former City of Redcliffe. According to an article retrieved from Wikipedia in October 2009, the name is derived from the Newport Waterways housing estate that developed after the artificial canals were first filled with water in 1979. One wonders whether the name was inspired by Newport on the Isle of Wight, and/or the city of Newport in south Wales. Northgate (Aberdeenshire) also in four English counties. The Brisbane suburb was named by the Railways Department in the late nineteenth century and was made up from 'North Coast Line' and 'Sandgate'. Red Hill (Aberdeenshire) also all over England but the reason for the name of this Brisbane suburb is purely descriptive of the colour of the soil in the area (Queensland Government website). Redbank and Redbank Plains - there is a place called Redbank in Dumfries & Galloway. Major Lockyer named the area whilst exploring the Brisbane River, but the reason for the name was not given. The Ipswich City Council website provides the following explanation: "The Redbank area owes its origins to pastoralism and agriculture, but has had a more diverse history. Though said to have been named by the exploring Major Edmund Lockyer in 1825, his red bank was near Bryden. Redbank probably took its name later and more directly from the red soil in the riverbank." 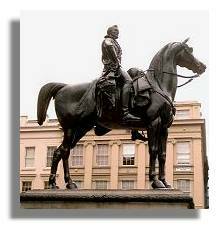 Edmund Lockyer (1784-1860), soldier and explorer, was born at Plymouth, Devon. It is unlikely, therefore, that these suburbs were named for the place in Scotland, even indirectly. Redland Bay - Redland and Redland Hill are places in the Orkney Islands but the name Redland is also found in southern England and in Wales. "Redland Bay township was established in the 19th century by settlers attracted to the fertile volcanic soil and pleasant climate. The redness of Redland Bay soil derives from iron oxides present in lava from a volcano that erupted (millions of years ago) in northern New South Wales, some 100 kilometres to the south." (Wikipedia article on Redland Bay, retrieved in October 2009). Russell Island - there is a Russell Mains in Fife but Russell is far more commonly encountered in place names throughout England and there is also a Russell Hill in Monmouthshire, Wales. Russell is nevertheless a fairly common Scottish surname, derived from 'rous' meaning red. The earliest reference in Scotland to this name is in 1164. The Scottish Russells have their own family tartan - seen here. "A basic survey of the island was conducted by Robert Dixon in 1839. He named the island after Lord John Russell the Secretary of State for the Colonies in the 1840s." (Wikipedia article on Russell Island (Moreton Bay), October 2009). Lord John Russell (1792-1878), twice Prime Minister of Great Britain, was born in London. Sheldon (Aberdeenshire) but more common in England. According to the Queensland Government website, this outer suburb of Brisbane was actually named for a place in Devon, England. Slacks Creek - there are places called Slacks in Dumfries & Galloway and East Ayrshire, Slackshaw Burn in East Ayrshire, Slacks of Cairnbanno, Slacks of Glencarvie and Slacks of Pitreadie in Aberdeenshire and a hill called The Slacks in West Dunbartonshire. Places with 'Slack' in their name are also numerous elsewhere in Scotland and to a lesser extent in northern England. As a family name, however, Slack is far more likely to be English than Scottish (Ancestry.com). The name of this suburb in the Logan area commemorates a pioneer farming family in the 1840s. John and Sarah Slack, cattle grazers, came from Berwick-upon-Tweed in Northumberland, England (Place Names of South East Queensland website). South Bank (Midlothian; also Aberdeenshire and North Ayrshire, both spelt Southbank) but frequently found in England and Wales as well. The name of the South Brisbane neighbourhood is probably purely descriptive of its location on the south bank of the Brisbane River. Springwood (Scottish Borders) also in Staffordshire, England. This outer suburb of Brisbane derives its name from a property named Springwood because of a running spring in the bush. According to the Logan City Council website, "the area was scrub with wild brumbies and plenty of wildlife, but it did have a spring in the middle, hence the name Springwood." Virginia (Orkney Islands) also in Ireland and on the Isle of Man. According to the BRISbites website, the suburb was named after Virginia, the first permanent English settlement in America and therefore has no immediate connection with any particular place in the British Isles. Wellington Point - there is a Wellington in Aberdeenshire and a Wellington House in Midlothian, but Wellington is found more commonly in England than in Scotland. According to the Queensland Government website, the suburb derives its name from the point feature, which was named probably by James Warner, surveyor during 1841, presumably after the Duke of Wellington, hero of the battle of Waterloo. That's his statue in Glasgow seen here. West End (South Lanarkshire) but found even more commonly in England and to a lesser extent in Wales. In the Queensland Government website it is stated that the name is geographical, being to the west of the city centre, but also reflects an English name (London's famous West End). The former Pine Rivers Shire suburban area has: Arthur Williamson Park (Samford Village), Idella Petrie Park (Murrumba Downs), Jack Gilliland Oval (Kallangur), James Drysdale Recreational Park (Arana Hills), John Davidson Park (Bray Park), Mackenzie Park (Mango Hill), Mathieson Park (Petrie), Mike McGuill Park (Arana Hills), Peter Campbell Park (Bray Park), Ross Reserve (Kallangur), William Scott Park (Arana Hills) and Vera Murray Park (Petrie). In the former City of Redcliffe and the suburban areas of the former Caboolture Shire are to be found: Brodies Park (Morayfield), Buchanan Park (Burpengary), Doug Ross Oval (Deception Bay), Harry McLaughlan Memorial Bird Garden (Caboolture), Kenna Park (Kippa-Ring), Scotts Point Progress Park (Woody Point) and Taradale Park (Kippa-Ring). Logan City, Redland City and the northern suburban parts of Gold Coast City have: Alexander Watt Park (Bannockburn), Geoff Skinner Wetlands (Wellington Point), Logan Gardens (Logan Central), Neville Lawrie Reserve (Priestdale), Sel Outridge Park (Redland Bay), Sturdee Park (Loganlea), William Ross Park (Cleveland) and William Stewart Park (Thornlands). Brisway: Brisbane, Sunshine Coast, Gold Coast Street Directory, 2005 (Brisway Publishing Pty Ltd). Greater Brisbane, 2003 (HEMA Maps Pty Ltd). Ipswich City Council - Suburb and Place Names. Brian and Barbara Kennedy (1989). Australian Place Names (Hodder & Stoughton, Sydney). Neil Heather and Vicky McKenzie, for information on Swanbank and Calamvale respectively. Place Names of South East Queensland website (archived site). Queensland Government (Department of Environment and Resource Management) Official Website. A.W. Reed (1973). Place Names of Australia (A.H. & A.W. Reed, Sydney).